Cellecta offers a range of lentiviral constructs that express Streptococcus pyogenes (Sp) Cas9 nuclease or dCas9 (catalytically dead Cas9) hybrid genes for CRISPR knockout, CRISPRi, and CRISPRa gene editing and sgRNA screens. The genes for all the Cas9 variations are over 4kb in size and thus are relatively large for lentiviral constructs. As a result, packaging of the Cas9 constructs is somewhat inefficient. Also, the expression level of the relatively large Cas9 proteins can vary with different promoters in different cell systems and experiments. 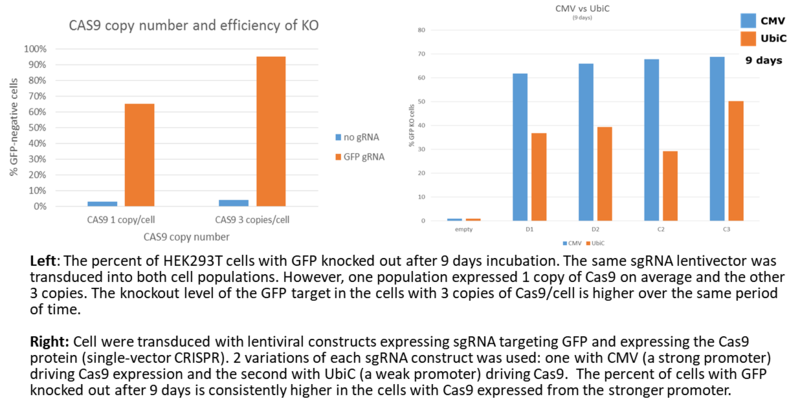 Before running CRISPR sgRNA screens or other CRISPR-based assays, such as CRISPRa activation or CRISPRi knockdown, it is a good idea to optimize Cas9, dCas9-activator (e.g., dCas9-VPH), or dCas9-repressor (e.g., dCas9-KRAB) in the target cells. For this purpose, Cellecta offers the CRISPR-Test Assay kits to measure intercellular activity of Cas9 and the dCas9 activators or repressors, along with plasmid constructs expressing the Cas9 and dCas9 variants with different promoters and selection markers. To make it easier for researchers to make cells that optimally express Cas9 or dCas9 repressor or activator proteins, Cellecta offers a combination of four Cas9 expression constructs at a reduced price when purchased in conjunction with one of the CRISPR-Test Assays. As described below, you can get four packaged Cas9 or dCas9 expression constructs–each with the Cas9 protein driven by a different promoter (CMV, EFS, RSV, and SFFV)–at half price, a $1,000 savings–when purchased together with one of the CRISPR-Test Assays. Individual Cas9 constructs are available in both packaged and plasmid forms. For use with CRISPR gene inhibition (CRISPRi) or gene activation (CRISPRa) systems, plasmids expressing either dCas9-KRAB or dCas9-VPH are available. We also offer MDA-MB-231 cells stably expressing Cas9, dCas9-KRAB or dCas9-VPH. We can also provide other configurations of Cas9 or dCas9 expression plasmids on a custom basis. Please inquire if you require something different than the items described above.